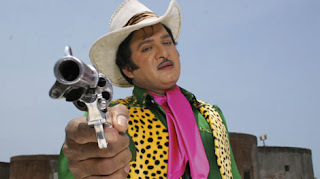 Quick Gun Murugan first came on our TV screens on Channel V about 15 years ago. It was funny then in its five minute (or less) format. Now they have a 90-minute movie that does have the potential. Dr Rajendra Prasad is spot on for the title role, Rambha is vivacious and apt as Mango Dolly and Naseer is competent as the villain - Rice Plate Reddy. It is the meandering story that plays the spoiler here - the real villain, for as the novelty wears off, there is very little to laugh at. Quick Gun has the heart at the right place, the stereotypical South Indian accent, the self-righteous and bullet-biting hero but it is genuine humour it lacks. Still, at 90 and odd minutes, it is not a bad watch. It isn't great, probably they could try again in a sequel, perhaps? Dog Story: Canine Hiring Inc.